SPORT Toni System AR15 Vorderschaft aus Alu gefräst und eloxiert in Rifle Länge ca. 37,5cm ohne Schlitze - dass es den Sportschützenvebänden nicht den Atem verschlägt! SPORT Toni System AR15 Vorderschaft aus Alu gefräst und eloxiert in Rifle Länge ca. 31,5cm ohne Schlitze - dass es den Sportschützenvebänden nicht den Atem verschlägt! One-piece tube with aluminum barrel nut eliminates barrel pressure points to improve accuracy. Lightweight and strong, carbon fiber tube with fron swivel stud won’t absorb heat, so tube remains cool even after long strings of fire. Attractive and durable with a distinctive weave pattern that changes with the viewing angle. Requires installation of supplied, separate barrel nut and gluing of tube to nut with Elmer’s Ultimate, Devcon High Strength, Gorilla Glue, or equivalent bonding agent. SPECS: Carbon fiber, black. 12" (30.6cm) long. 2" (5cm) diameter. 6.2 oz (175 g) weight. TROY Alpha Vorderschaft rund, mit Längsrillen und durchgehender Picatinny Rail in Upper Höhe, sowie 3 Rails zum anbringen am Schaft, in XL Rifle Länge in 15"
Machined aluminum free-float handguard employs a unique barrel nut and rotary-locking system to ensure proper alignment of top rail with receiver rail. Handguard slides over barrel and gas tube at an offset angle, until the notched barrel nut indexes in the internal grooved channel for a secure fit. Two hex head screws lock down the handguard, and a built-in stop prevents over tightening. Vent holes let heat escape the barrel and minimize weight. White alpha-numeric designators on the cross-slots ensure easy repeatability of accessory positions. Streamlined Alpha models have a single, top Picatinny rail, deep horizontal grooves for a secure no-slip grip, and additional ventilation holes to reduce weight and dissipate heat. Come with three bolt-on rails for mounting additional accessories exactly where you need them. Alpha models fit standard factory AR-15/M16 barrel nut. SPECS: Machined 6061 T6 aluminum, hardcoat anodized, Teflon® coated, matte black finish. Each model available lengths listed below. Mounting hardware and instructions included. Alpha fits AR-15/M16 rifles and carbines and attaches to the factory barrel nut. 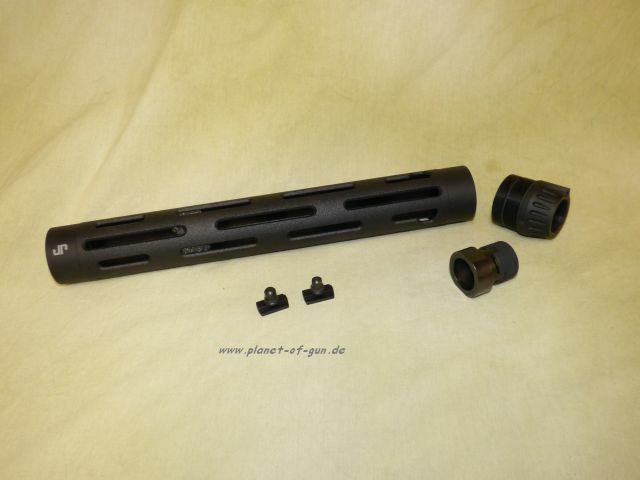 TROY Alpha Vorderschaft rund, mit Längsrillen und durchgehender Picatinny Rail in Upper Höhe, sowie 3 Rails zum anbringen am Schaft, in Rifle Länge in 13"
TROY Alpha Vorderschaft rund, mit Längsrillen und durchgehender Picatinny Rail in Upper Höhe, sowie 3 Rails zum anbringen am Schaft, in Mid Länge in 11"
TROY Alpha Vorderschaft rund, mit Längsrillen und durchgehender Picatinny Rail in Upper Höhe, sowie 3 Rails zum anbringen am Schaft, in Mid Länge in 9"
TROY Alpha Vorderschaft rund, mit Längsrillen und durchgehender Picatinny Rail in Upper Höhe, sowie 3 Rails zum anbringen am Schaft, in Carbine Länge in 7,2"
With a new enhanced attachment method that combines aesthetic polish and durability, the JP MKIII system accommodates both the stylish, rock-blasted JP Signature tube with its faster rail relocation and new textured finish. Like its predecessors, MK III allows for easy rail mounting at any of the cardinal points along the tube as well as at the 45°s while also offering continued compatibility with all JP Tactical Rail accessories. Manufactured as ever to the uncompromising JP standard, the MK III system is the final word on modular design fusing simplicity and utility with the benefits of both: New, patented attachment method dramatically improves structural integrity while allowing for perfect alignment to bore axis comparable to one-piece, monolithic systems Offers top rail continuity, allowing bridging of the receiver and hand guard rail with optical mounts Barrel nut redesign allows for easier and faster barrel installation or replacement Internal barrel retainer nut serves as a lifetime component that doesn’t distort like one-piece, one-time-use aluminum barrel retention nuts Easily interchangeable tubes with rapid re-indexing Standard, readily-available 10-32 screws for rail attachment less limiting compared to the problems of proprietary hardware Ergonomically optimal 2" tube diameter easily clears minimized gas block and is available for both small- and large- frame models Fits - AR-15/M16 pattern rifles. SPECS: Fits - AR-15 rifles. Available in 12.5" or 15" lengths. Inside Diameter - 1.75". Outside Diameter - 2". Weight - 12.5": .765 lbs. 15": 1.144 lbs. DRAGON 12" Vorderschaft von Double Star, rund, mit "Schuppen" und vorn cool gezackt! 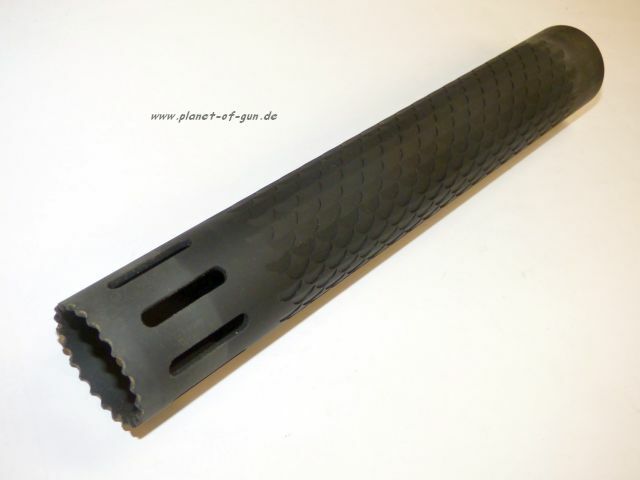 Free float AR-15/M16 handguard with Dragon Scale pattern for improved grip. Pattern completely encircles handguard circumference, ensuring a positive hold on the rifle. 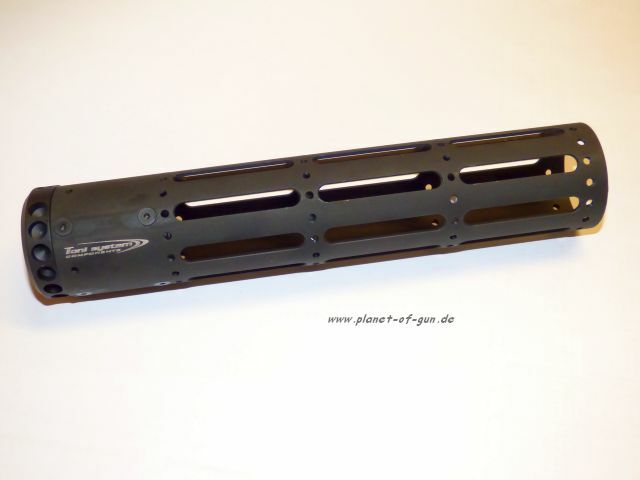 Available in 12” rifle length, and machined from 6061 T6 Aluminum, this is the perfect handguard for a competition gun. 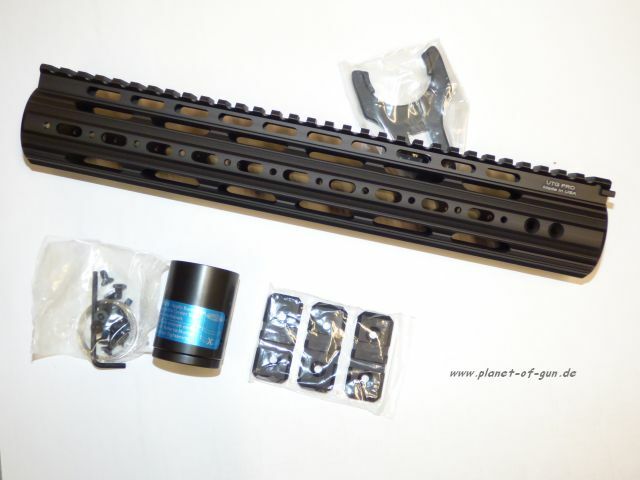 The handguard features a matte black anodized finish, and includes a barrel nut. Utilizes standard AR-15 barrel nut wrenches for installation (no included). 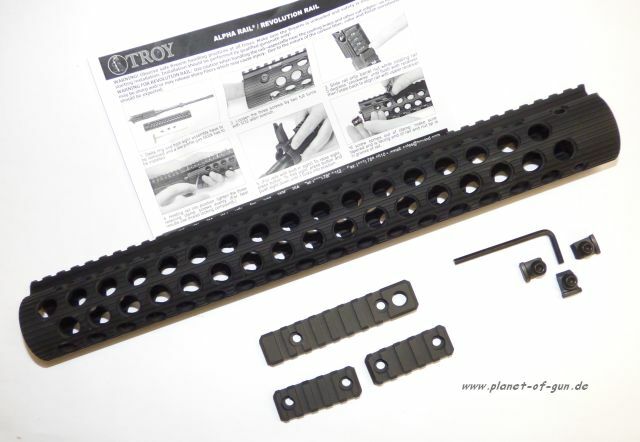 Fits 223 AR-15/M16 upper receivers.